We are big proponents of using the 15 Commitments in the work we do in Conscious Leadership. They have forever changed every aspect of my personal and professional life. However, as an Enneagram Type 1 who is most happy at maximum productivity, I’ve always had a hard time buying into Commitment #9, the commitment to play and rest. Until yesterday…. I love to ski. I have become an expert in integrating my work and productivity into skiing. 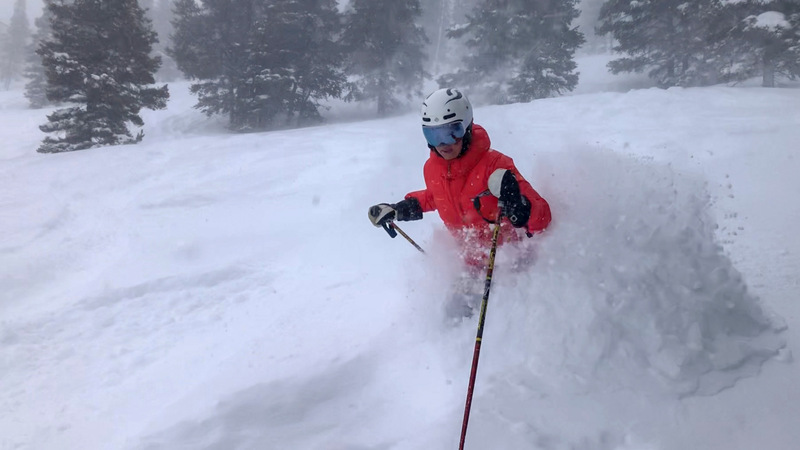 Last week, I had a ski meeting with a prospective MergeLane investor scheduled for Thursday, a day on which nearly 30 inches of snow was forecast. I was looking forward to a productive and fun ski meeting until I received a last-minute cancellation the night before. The next morning, I did indeed wake up to 26 inches of new snow. A 26-inch powder day in Vail is an extreme rarity, but when I looked at my even-fuller-than-usual inbox, I started feeling guilty about the idea of going out to enjoy it. Finally, I just decided to just go for it and headed out the door. I met my friend, Joel Holland, to stand in line to get the first chair. Joel, the founder of Storyblocks and CEO of Harvest Hosts, is a successful, focused, and driven entrepreneur with an inbox undoubtedly as full as mine. While we were waiting in line, I started telling Joel about the guilt I was feeling and asked him if he felt the same. “Yeah, he said, “but my work is there now, and it will be there when I get home.” I decided that was going to be my mantra for the day. The snow was even better than we anticipated, and it was very possibly the best day of skiing I have ever had. Enjoy this video, courtesy of Joel. I had forgotten my feelings of guilt until I got off the mountain and opened my inbox to see an email chain involving my business partner and one of our portfolio companies around a fairly important matter. I felt another rush of guilt as I realized that my business partner had to carry some of my weight for the day. I called her to apologize and to ask her if she needed any support. In that moment, I felt an extreme sense of gratitude for my business partner. It was a welcome reminder of why we work so well together. We are both driven, responsible, intensely passionate about our work, and fiercely committed to supporting each other. I was so tired from the day of skiing that I couldn’t process much else until I woke up the next morning. I jumped out of bed after an hour less sleep than usual because I was so pumped from the day before. I got right on my computer and started pounding out some of my to-dos that I had trouble mustering the motivation to get through the day before. Not only did I have a renewed sense of drive and passion for my business, I had an even stronger appreciation for my team. I can’t tell you how lucky it makes me feel to be a part of a team who not only steps in when I’m not there, but supports me in saying yes to life, allows me to live in my zone of genius, and lets me give what I can without giving too much of myself. In conclusion, I’m strengthening my belief in Commitment #9. The next time I need an extra hour of sleep, want to take advantage of a powder day, or feel the urge to say yes to something that makes me feel alive, I am going to ask myself a different question. Instead of asking myself how far it will leave me behind, I’m going to ask how far it will propel me ahead.